Here's Elizabeth Langston talking about The School of Now! Lacey, the heroine of I Wish, has a lot of goals: pay the bills, handle her mother, and take care of her brother Henry. But she has another goal, less often mentioned but still huge. Lacey wants to graduate early. I spent 19 years in public schools. Once my girls were born, I would’ve expected them to do the same. But it hasn’t worked out that way. My older daughter has health problems. When she became too ill to complete high school, we pulled her out after her sophomore year and found an online high school. She loved it, and we loved it. When her younger sister was a freshman, she went to the online high school too. They’re both having a great time in college now. We discovered that there are a lot of options for an education. A 21st century student can choose schools that are public, private, home, online, charter, science&math, performing arts, or vocational. It’s all about finding what’s right for each person. That’s why I love to write about different types of schools in my books. In the Whisper Falls series, the heroine Susanna (who dropped out of school at the age of ten) must use independent study and then pursue a GED program. With I Wish, Lacey’s friend Kimberley has tried public, private, and homebound education. I have a homeschooled student in a manuscript I’m writing now. Elizabeth’s debut novel Whisper Falls released in November 2013. Its sequels, A Whisper in Time released in April 2014 and Whispers from the Past released in October 2014. 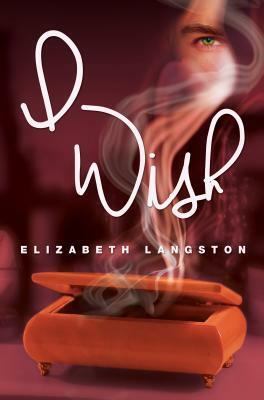 Her new series begins with I Wish in November 2014. There are a TON of prizes up for grabs; just enter the Rafflecopter HERE! This isn't my normal kind of read, but it sounds interesting! I am going to seek out reviews, I think. Thanks! This sounds brilliant!! If I could read one person's mind, it would definitely be my pet because I honestly am quite curious about what they could be thinking. Thank you for the giveaway!!! !